Dr John Hobbs (Department of Management and Enterprise, CIT) when presenting at the RSAI conference in Aberystwyth, Wales last August was invited by Professor Geoffrey J.D. Hewings to share his research on V-LINC at the Regional Economics Applications Laboratory (REAL) Seminar Series in the University of Illinois at Urbana Champaign. An opportunity presented itself for Dr Hobbs to take up this offer as a precursor to a planned trip to present work at the TCI conference in Monterrey, Mexico from the 9th - 13th November. 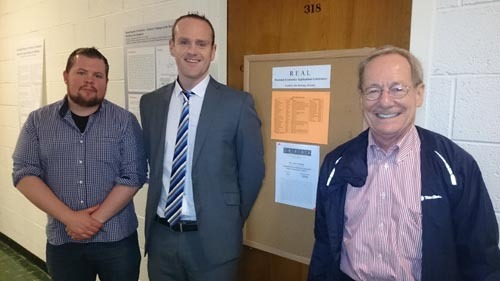 Pictured above: Dr Andrew Crawley (University of Illinois); Dr John Hobbs (Cork Institute of Technology) and Professor Geoffrey Hewings (University of Illinois) pictured at the Regional Economics Applications Laboratory Seminar Series in University of Illinois. REAL founded in 1989 by Professor Geoffrey J.D. Hewings at the University of Illinois at Urbana-Champaign is a regional science research centre for advanced graduate students in the fields of economics, geography, urban and regional planning. University of Illinois is currently ranked 24th in the world on the Times Higher Education ranking. Since its inception, REAL has provided at least two years support for 38 doctoral students from economics, geography and urban and regional planning and hosted over 100 international scholars and visiting professors. Dr Hobbs presentation at the seminar series on the 4th November focused on the application of V‐LINC to the Biopharma and ICT sectors in Cork, utilising data collected in partnership with 7 ICT clusters in the BeWiser FP7 funded European Union project. V-LINC is a new software application developed in the CIT School of Business which maps, visualises, and analyses key relationship data collected from clustered firms to inform strategy and policy development for the organisations involved as well as catering for regional and national analysis. Dr John Hobbs and Postgraduate student Eoin Byrne have driven the development of V-LINC in CIT. In Ireland, V-LINC is being implemented to map the cluster ecosystems in Biopharma, ICT and Agri-food sectors in conjunction with it@cork European Tech Cluster, IMERC and the West Cork Development Partnership, with the support of Cork County Council. REAL was created to operate like a science laboratory - with students and faculty together in one space, promoting interaction and collaboration. A weekly seminar series provides students with many opportunities to present their research and an active Discussion Paper series on the web ensures wide dissemination for research. REAL is supported by external grants and contracts, many of which have been developed with agencies in Brazil, Chile, Colombia, Indonesia, Japan, Korea, and Austria. Most of the research has successfully served two markets - academic journals and public policy.